Stranded in Chaos: It's the little things that get you. It's the little things that get you. If you're new to the blog, please read Lucy's birth story HERE otherwise you might not understand why I'm a hot mess. I know I've always been open about my depression, and this will be no exception. It feels like every time I'm making some progress, that maybe I'm getting better, the universe shows me how messed up I still am. I should have known better taking on this project because just a week or so ago when my brother, sister in law, niece and nephew were here I didn't do so hot. I was actually OK when I saw my baby nephew. Granted, I didn't full on look at him, but he was next to me and I was doing alright. I was a little warm and it felt like little pricks all over me. You know when your leg falls asleep and you go to move it but it feels like needles? That's what it felt like, but all over my body. The cry is what did it. It sent me over the edge. I tried so hard. I sat in my seat, looked at a light, looked at the ceiling and counted backwards. Counted my breaths, tapped out a line on my leg, tensed every part of me and let it go, I did all of that and I just couldn't stop. I started crying. I realized there wasn't anywhere for me to actually go so I grabbed my theraputty stuff and I was in the hallway and doing breathing and counting exercises, squeezing the hell out of the putty, and it took me about 15-20 minutes to calm down and be normal. Now, I could have said something to people but it's not their fault. They shouldn't have to change what they are doing because of me, it's my job to adapt to them because this is life. But I've thought about that episode a lot lately. At my recent medication adjustment psychiatric appointment I talked about the unbelievable fatigue I still have and how I can't even do basic things without feeling like I need a nap to recuperate. Do you remember those commercials for Energizer batteries that had the Energizer Bunny? I compare it to that, when the bunny goes and goes and suddenly the batteries go down so you see this bunny get slower and slower but finally stopping? That's me. I can feel it happening in my body, it feels like a curtain coming down and I have to take a nap and it doesn't matter where I am. Which is great if I'm at home, not so great if I'm at Target. I've been on three different drugs at maximum doses and it doesn't do anything for me. I didn't notice any kind of difference. So my next option is Ritalin. You guys, I am a 36 year old woman just put on Ritalin. It kind of works. Which is how this happened. It's just before dinner time and I'm zipping along with my Ritalin and I got the idea that I would clean and organize. We have an unused dresser and I decided I was going to use it in the basement to store mementos of the kids growing up. I've been storing all of these things in the closet in my office and it's getting crowded in there so I figured this was a good time to move it all down. But of course, if you start pulling it out, you'll want to look in it. So I labeled each box with their name on it. 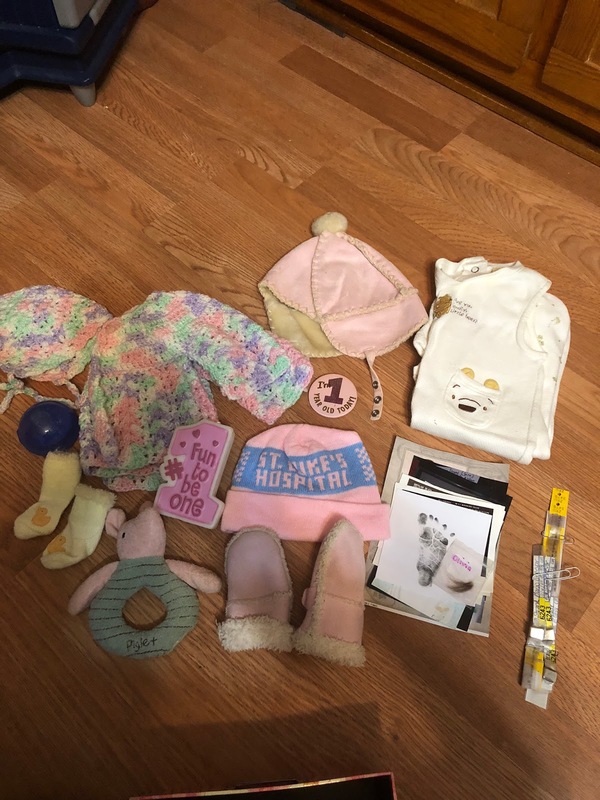 I started this when Olivia was little and it holds the hospital bracelets, ultrasound photos, coming home outfit/hat, etc. I just wanted a box that had their stuff in it so maybe they'd want to look at it someday. Or use the clothes/sweaters for their kids. I don't know. I'm just sentimental and I was really good at only saving what would fit in this little box. Then I looked into Lucy's box. 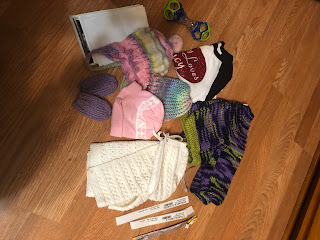 Inside Lucy's box are my hospital bracelets, one of hers, some ultrasounds, a rattle, a few hats, mittens, two sweaters and a shirt. I know the shirt came from my friends Gini & Eric. The rest of it... I have no idea. I realize nobody saved her coming home outfit. Nobody took pictures of us coming home so I can't even include it. I didn't save her birth announcement. I know it's stupid. I know in the grand scheme of things, it's not a big deal and she likely isn't going to care. I know all of this. But it's a big deal to me. Maybe more so with Lucy because I don't remember any of it and I so badly want something to help me remember. I want something tangible from that time. It's one thing to have had the Amniotic Fluid Embolism, but it feels cruel to take my memories away, too. It's bad enough that I look at baby pictures and I may as well be looking at a stranger. I want to remember what her cry sounded like, if she had hair and what it felt like on my cheek, what did she smell like, what did she feel like laying on my chest? I want to remember looking at her for the first time, having her handed to me all bundled up safe and snug. Did she like kisses on her cheek like her Penelope and Jackson? Did she want nothing to do with me like Olivia? Did she like being swaddled? Did she like it when I sang You Are My Sunshine? I'll never know any of this. It makes me so sad. It makes me feel like a failure of a mom that her box isn't great. That her baby book won't be like the others. That I'll never be able to tell her what she was like. I'm angry because I know that all of the moments I have today with her will be gone in a week or two. They are only borrowed moments. The pictures won't matter to me, but maybe to her someday. I hope she knows even if her mother can't remember that her mother loved her a whole lot. I hate feeling like things aren't even between the kids. I hate feeling like Matt knew I kept all of this stuff and why it was important to me and he couldn't even do it right. And I absolutely KNOW he had a lot going on but I'm angry that this just highlights everything is on me. Having died twice isn't enough to get out of those duties- it's still my job even if I can't remember. It's so frustrating. 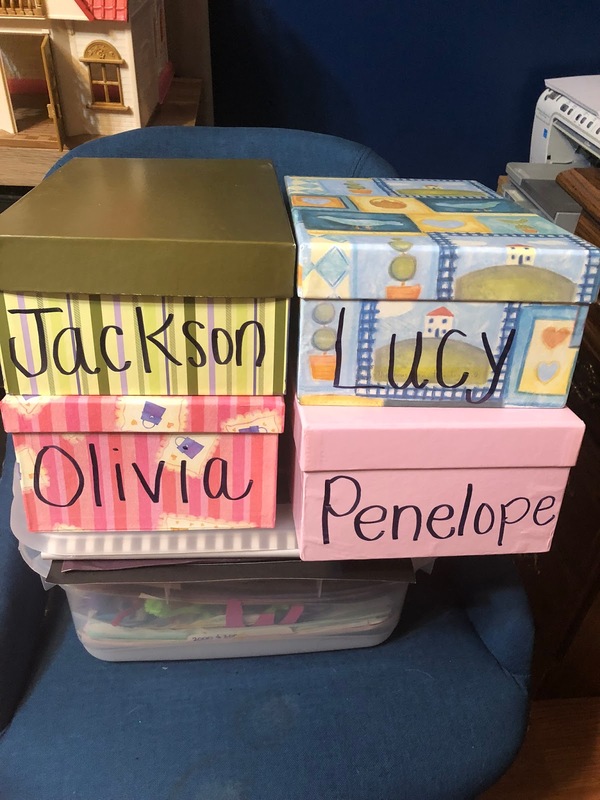 For perspective, this is Olivia's box. 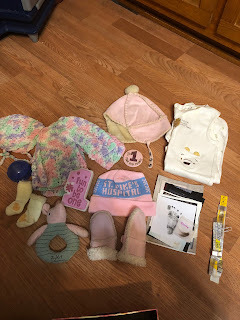 All the bracelets, a large packet of photos, footprints, baby announcement, and ultrasounds. 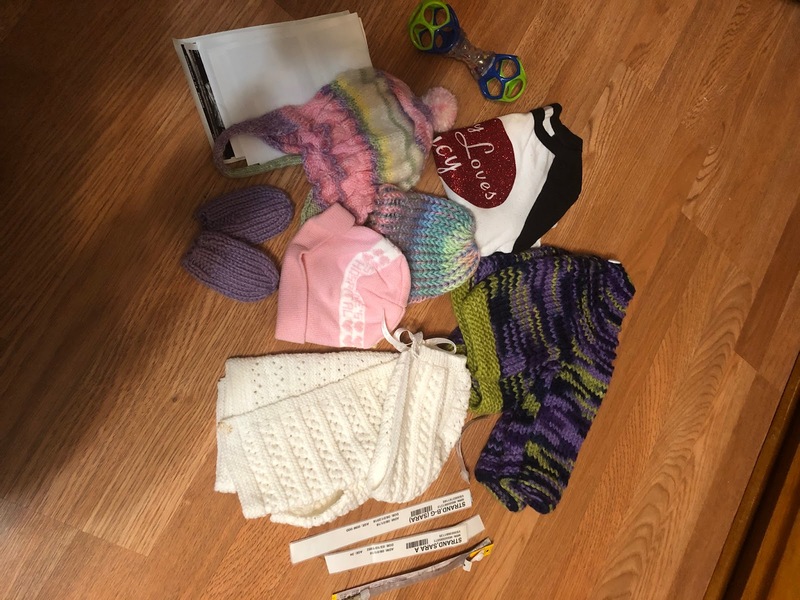 Coming home outfit, first winter hat and mittens, hat from hospital, sweater made by Matt's grandma Bernice, Piglet rattle because she had a Classic Pooh room, first socks, first pacifier in a holder, candle and button from first birthday. Jackson and Penelope's are identical. It makes me angry. It makes me sad. It makes me feel like a terrible mom. It makes me feel like I'm not getting any better so I'm frustrated. I feel hopeless. I feel defeated. Thank you for sharing your experience. It’s so important and it helps others who cannot or will not be as open. I'm so sorry, Sara. I know there really isn't much any of us can say, but seriously, you are not a failure. You are a great mom, and you're doing the best you can. Just having a box of ANYTHING is incredible - not all moms do that, and it's wonderful that you did. Awww momma bear... this makes my heart ache for you. I’m so very sorry. I know there is absolutely nothing I can say to take away that hurt and frustration and anger but I hope you continue to write about it because sometimes that helps so very much, even when you don’t think it will. I know it doesn't make it any better, but I'm sorry Sara. You are a fantastic mom, which shows in everything you do and don't do. I have no excuses, and the twins have no scrapbooks at all. My oldest has a whole year of things done, then nothing. Just nothing but love for you mama. I can't make it go away, but I can send you lots of love and tell you that you are an amazing mom and and amazing human being. If it helps, I knitted the green and purple sweater in the photo for Lucy and mailed it to you. Let me know if you need any more information. I know this isn't your thing at all but by baby number 4 they are lucky they even have a box in most families lol. My husband is #6 and he has ONE baby photo. And suddenly it all came to me. Christmas Day. Exhausted thinking about it.